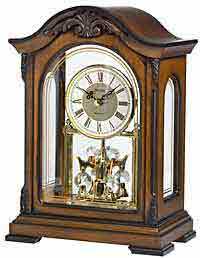 Gracefully curved mantel clock with polished brass finished bun feet finished in a brown cherry stain to accent the natural wood grain of the veneer. With quartz movement, clock includes a diamond-cut brass finished bezel, convex glass lens, and traditional Roman numeral dial with filigree-cut metal hands. Lower case with mirror inset houses the Bluetooth® wireless speaker system. Stream any type of programming from a smart phone or tablet and hear it from the clock wirelessly. Works with Android and IOS software. Bluetooth® speaker, powered by rechargeable batteries, can be placed up to 20 feet away from the device. Included is a USB cable and universal charger for worldwide use. Requires (1) AA battery for clock (not included). Rechargeable speaker batteries included. Size: H: 13" W: 11" D: 5"
Clocks for sale at The Clock Depot including the B6217-DS at discount prices.